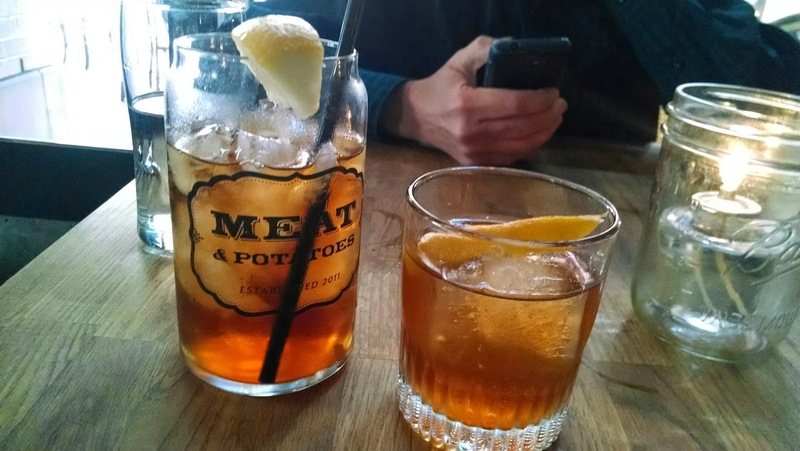 Saturday we had tickets to see Peter & the Starcatcher (not a show I enjoyed much) but best of all, we had reservations after the show at Meat & Potatoes. I've been thinking about the macaroni & cheese and the flatbread ever since we last dined there in November 2013. I took my camera, but I was sure I wouldn't take photos because we would probably order the same dishes we always order, plus, it's usually a bit too dark for good photos. Delicious fresh brewed iced tea and Sgt Pepper's Old Fashioned - so good! Southie - Jameson Black Barrel, lemon, black Irish tea syrup, apple cider, mint. This is really tasty, a little sweet, refreshing from the mint. After I finished my Old Fashioned (really surprised how quickly I sucked that down, because it was a strong, for me, drink) and helping SP with his Southie (yum, and, well, he's not supposed to be drinking much anyway) I decided to try Bufala Negra - heaven hill, ginger, balsamic reduction, basil, brown sugar, Pittsburgh seltzer. This is another really good cocktail and I can't decide which of the 3 I liked best. I guess we'll have to always order all 3! No surprise - we ordered the Fried Brussels. So. Good. Of course we got the Fried Pickles with spicy ranch - still the best I've had. SP ordered the coup of the day - a take on vichyssoise, with broccoli, cheddar foam, and ramps. He loved it. Me, not so much, but remember I am not a huge fan of soup and especially not chilled soup, especially not chilled soup with ramps - whether a ramp is a wild leek or wild garlic or spring onion, it all means tummy unhappiness for me. Short Ribs & Blue Cheese Flatbread with cheddar, horseradish, pickled onions, and arugula. Just as delicious as last time. Mac-n Cheese with chorizo, pulled pork, government cheese. I am never going to be able to resist ordering this. SP got the daily charcuterie board. I can't remember everything that was on the board. Closer view. In between mouthfuls he mumbled something about delicousness and before I knew it, the board was empty except for the bread, which was more of a carb issue thing than tasty bread thing. Someone wanted dessert. And it wasn't the person who usually wants dessert. The dessert craving person chose Strawberry Pretzel Pie. The white part is like a super smooth, creamy white chocolate mousse (I think). Crushed pretzel crust. Strawberry topping. It was very tasty, but I had just a couple spoonfuls because I was stuffed. We have enjoyed Meat & Potatoes more & more with each visit. When we walked past on out way to the show, it was so sunny and warm that we stopped in, mentioned our reservation for later on, and asked to be seated outside. Of course by the time we went back for dinner around 5:15, there wasn't any sun shining on the outdoor dining area and there was a breeze which had given me a chill as we sat in Eyeball Park for a while after the show. So I asked if they could seat us inside after all. And I felt horrible. Because I probably messed up all their planning and arranging of reserved tables. But I was very happy that the hostesses happily changed us to indoor dining. I'm such an old lady - a breeze in a shady area on a 73 degree day makes me chilly and want a coat. Our server was terrific. The food delicious. The cocktails refreshing & yummy. And my dining companion was pretty great, too. Still one of our favorite places. I'm already planning which show in the next Broadway Across America series is followed by dinner at Meat & Potatoes.